There was a time when we thought the Honda Element Camper was the ultimate post-Westfalia portable camper. Then we saw the appropriately named Toppola camper shell made for a number of Saab hatchbacks. Starting with the Saab 99 combi coupe, the conversion was quick and involved mostly removing the hatch and dropping in the camper shell. 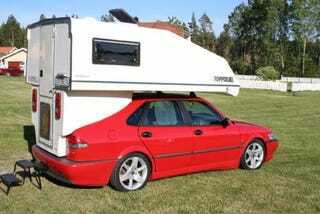 Made by SCANDO, the Toppola was also fitted to later Saabs including the Saab 900, 9000 and 9-3, which looks exceptionally fetching in red with the camper top.